I learned about this comic just around the time that it began. I was at my weekly drawing group and my friend remarked that a mutual friend was “obsessed” with this mysterious web artist. I was immediately intrigued and was told about Gigi Digi just days before she deleted her Deviant Art gallery. Very exciting, this idea of scarcity and rarity on the internet. Gigi Digi was tired of Deviant Art and decided to burn that bridge. 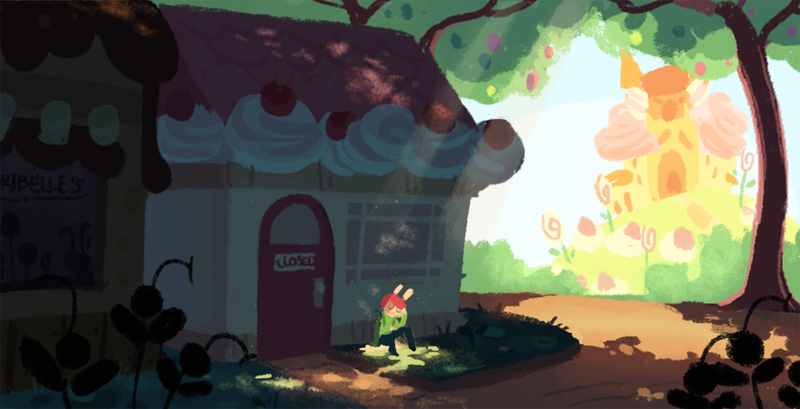 At the same time, she was just beginning her webcomic Cucumber Quest. The immediate sensation that I get from Gigi Digi’s art is that it is almost aggressively cute. It’s like the cute equivalent of playing tackle football on concrete. Irresponsibly cute. From the subject matter, the work is just as aggressive–Gigi Digi’s work punches with puns in the left fist, cliches in the right fist and strikes with a shamelessness that can only be described as fearless. Never one to pass on opportunity, Gigi Digi’s comics relish in rib pokes, winks and dad jokes. 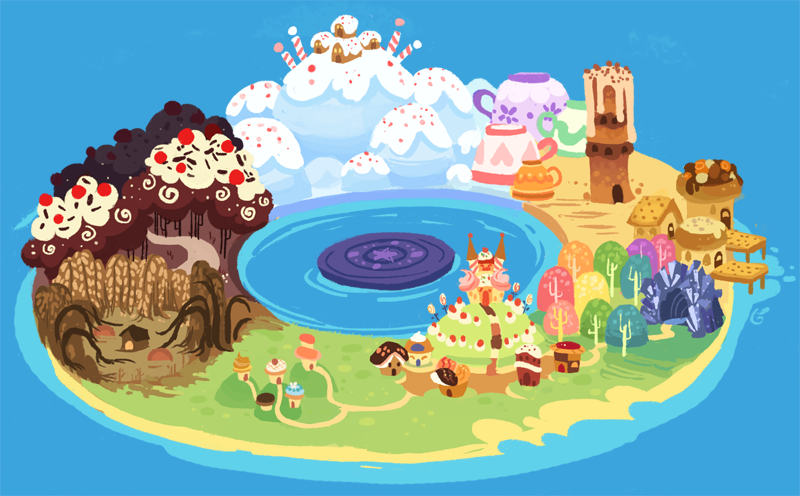 And to top it off, all of the characters and settings are pattern on the most adorable food products. At its core, the comic Cucumber Quest is a simple reversal of cliche roles. The title character, Cucumber (“Cuco”) is the little boy who is pushed into the heroic warrior role when all he wants to do is go to wizard school (that nerd!). To make things worse, his sister Almond is more than eager to take up the heroic quest but is forbidden from doing so. According to Gigi Digi, this panel is the basic core of the story. Cucumber Quest is a very well-written comic. Strong characterizations, the plot moves along at a pace that’s neither too hurried nor treading water, plenty of humor. But it’s obvious that the place where this comic truly shines is the art. 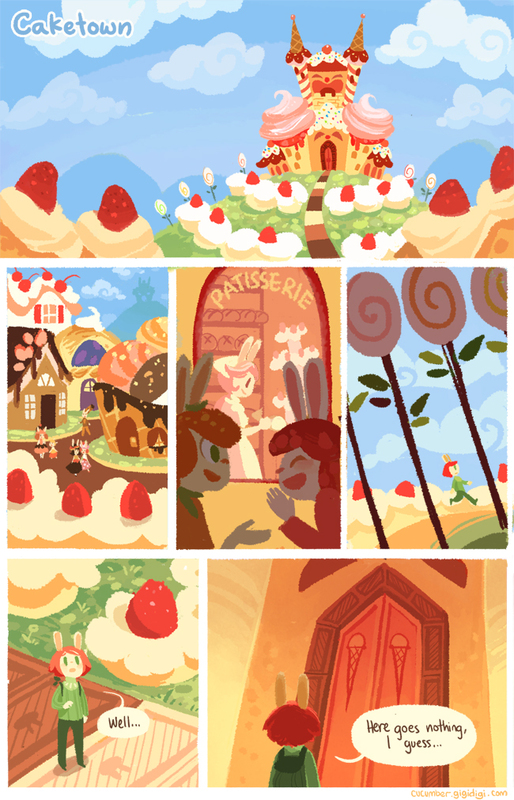 Cucumber Quest is an alarmingly gorgeous comic. I mean just look at that panel. The warm glow from the safety of Cucumber’s home set against the cool night sky of the rest of the world. This is Cuco leaving the house (being thrown out, actually), about to embark on his life-changing adventure. The colors tell the whole story. Directly below is Cuco in the city, sitting outside of another place; opposite composition: here the warmth of the city is in the background, passing him bywhile he sits in the shade, afraid. Gigi Digi’s lineless style of drawing is especially interesting. The entire comic is composed of shape and color and tone. You’ve seen some examples posted in this review that highlight the way she separates foreground from background with atmospheric perspective or by casting one part of the scene in shade and letting the other part glow with daylight. There’s a good combination of simple and complex art techniques working in these pages.